This book is primarily addressed to high school students and their teachers. It could be interesting also for university students studying mathematics and recommended to all those who have mathematical interest beyond the school curriculum. The main goal of this book is to improve the problem-solving skills through the use of inequalities. The book consists of 4 Chapters. The solved examples prepare the next chapters. You will find some typical wrong solutions in the notes which will help you avoid similar mistakes. This chapter contains 237 specific isoperimetric and related problems in the 2- and 3-dimensional Euclidean space. 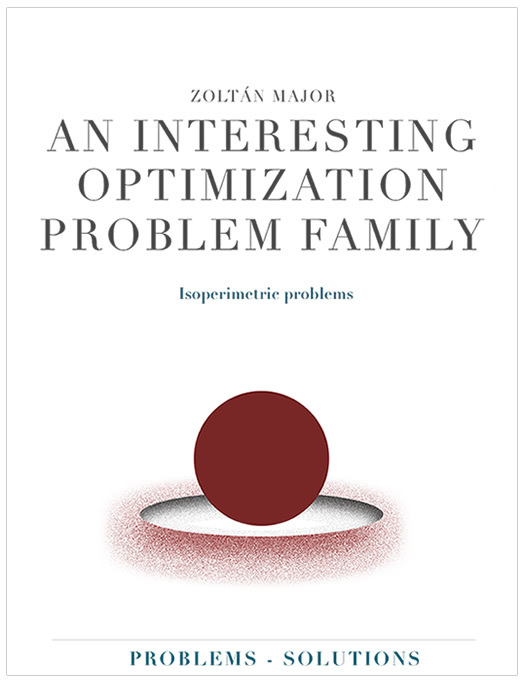 This chapter contains the solution on each of the 237 problems from the previous chapter. The preferred method is the use of inequality where possible. The most interesting results can be found in the Tables, at the end of the book. The books collected in the Literature section are just a small selection of the rich mathematical bibliography of this topic. In the Internet links section you can find some interesting web pages on classical isoperimetric problems. I would recommend some further research on the Internet with use of the keyword “isoperimetric” to make sure that you are aware of the most up to date information on this topic. An interesting actual example of the use of isoperimetric inequalities is, how it is incorporated in the design of robust computer networks. I wish you an enjoyable reading, also successful problem solving, and I hope that you can collect loads of new experience with the help of this book. The first edition was published in 1993 (paperback, in Hungarian). PDF format (Updated at Apr 27, 2013).